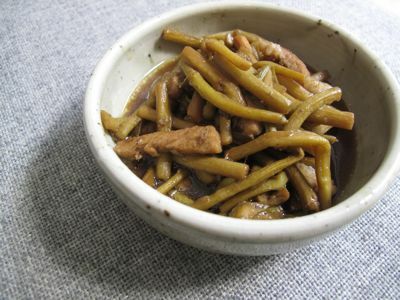 Takway are gabi or taro root tendrils or shoots, which I first wrote about here. I suspect, like okra or alugbati, takway are a love or hate ’em kind of vegetable, with texture the primary reason for falling on one side of the fence or the other… I liked takway the first time I tasted them, and since my host on this recent trip managed to get a kilo or so into our luggage, I decided to try and replicate the simple yet extremely satisfying “adobong takway” that we tasted on several occasions in Bacolod and the surrounding towns. The prep work to clean and peel the takway and wash it several times is the hardest part of preparing this dish. Once the takway is cleaned up, cut it into two to three inch pieces, and make sure you wash it well in several changes of water. In a pan big enough to accomodate the takway you plan to saute, heat up some vegetable oil. Then saute some garlic, onions and pieces of pork. I suspect some Negrenses use a bit of fish guinamos at this point but I can’t be certain. Then I added the takway and sauteed for a a minute or two over high heat. I added some water, kikkoman soy sauce and some cane vinegar. Adjust the liquid so that there is enough to steam the veggies but not drown them. Add about a tablespoon of dark brown sugar for about every 6-8 cups of cleaned takway, to mellow the sauce. Simmer covered for some 7-8 minutes until soft. Season with ground black pepper and salt if necessary. Cook until soft but not mushy. Do not undercook as taro can trigger some allergic reactions in some diners if undercooked. But it must be a little softer than “al dente”… Taste to figure out if you need to adjust seasoning. Serve immediately with lots of steamed rice. Delicious. A perfect simple and economical meal. Serious yum factor. i’m familiar with the taste of this taro stem because my mom used to combine this on her laing version. and i seems to like it. a little bit slimy but a very welcome taste than just pure leaves of the taro.. nwei, what happens to the leaves MM? did u make laing out of it?? Seriously i liked it too but i found difficulty on cooking it!its so itchy on the mouth once eaten,,that whats refrain me on eating it? how to avoid that itch i dont know? i love takway too. everytime one of our kasambahays return from their vacation in capiz, we are lucky to receive a bunch of these which they cook adobo style too. yummy! i love this, too, MM…i grew up on this dish and the one in previous post..
For gabi ( as we Tagalogs call it) lovers, preparing it is such a production but it is so good especially laing as prepared by the Bicolanos. As a young girl being taught how to prepare it, I would help my mom peel off the skin from the stems. It must be an incomplete process when part of the “skin” remains that gives the itching in the mouth. The itch from the leaves makes a good deer deterrent. A friend grew it in the perimeter of her property. Deer came and feasted on the foliage then never came back. I hope it did not kill them. sarap! i certainly agree when you say the prep is the hardest part. just getting rid of the itch is tough enough. i can’t count the number of itchy laings i’ve eaten. yep, you’re right MM. Guinamos is always added to this dish when we make this in Bacolod. Eat this right off the pan with a heaping of steamed rice… perfect! Thanks for that recipe MM, I will definitely cook this dish because I like “takway”. BTW, when you say “ginamos” is it fish or shrimp paste? I am very familiar with this dish. My landlady was from Bacolod and used to get them at Blumentritt and Divisosia Markets. Yes, it is laborious to prep the stalks and lots of caution is a must especially when heading to the bathroom. Ensure proper handwashing was initiated before heading to john otherwise the itch bugs travel with you and migrate through the wippies and the rest will be uncomfortable experience. Warm vinegar is the sure cure for mishandling the stalks. Natie thanks for your pitch in preparing this known Negrese and Ilongo dish. Belacan is the most comparable substitute for aged guinamos which can be easily obtained in the West in most Thai markets. They have Belacan in powder and compressed block forms. Good thing everybody here loves takway. Also takway to is a good addition to our “laswa” dish since it also adds making the dish more easy to “take in” lol. There was one takway cooking I tasted before and it was a cross between an adobo and laswa which was very good. Safe to say taht it was cooked adobo style but without or little guinamos and had sabaw. Interesting. I have only had taro leaf in the Hawaiian dish called “laulau”…I imagine this tastes similar? I liked the laulau well enough, but don’t recall any “itch” so I suppose the dish was properly cooked. What is the “itch” caused by? Homebuddy.. I would say “guinamos” is shrimp paste. I don’t know how it’s called in other places but in Bacolod, it’s made up of “hipon” or very small shrimp pounded into paste form. Guinamos is best paired with green mango. Yum! taro leaves, stems and tendrils ALL contain calcium oxalate, which is the source of the often mentioned “itch.” taro or gabi leaves, stems and tendrils, and I suppose the root as well should never be eaten raw. A good description of what can happen when you have a little brush with raw taro is well described by Jeffrey Steingarten in one of his books when an appetizer on business class on a transpacific flight from Tokyo to New York, was served over a cut raw taro leaf. Mr. Steingarten suddenly felt his throat constricting and had a fairly strong allergic or simply poisoned reaction to the dish. So basically, don’t eat it raw or undercooked. When washing it or peeling it, the calcium oxalate can and does get all over your hands, so if you are particularly sensitive to it, you will feel the itch. To prevent this, use plastic gloves or some books suggest your oil your hands before handling the gabi or taro. In some parts of the philippines, they semi-dry or dry the leaves before they cook them, presumably because the drying process also helps reduce the effects of the calcium oxalate, but the BEST way to avoid the itch is to cook the vegetable well, as is done in laing, a stew of the leaves in coconut milk. guinamos for Negrenses is shrimp paste, sold in blocks, I had a post on it here. Guinamos for Cebuanos and Bicolanos can refer to fermenting/fermented fish with salt, a saucier greyish condiment. In this case, I was referring to the Negrense guinamos, and yes, as mentioned by a commenter, it is quite similar to the Malay or Indonesian belacan, available in Asian stores in many large cities around the world. I figured I could taste a touch of it in the adobong takway in Bacolod, but I didn’t have any handy when I cooked the dish above yesterday. In Leyte, we cook it with coconut milk, ginger, lemon grass, red hot chili, and a bit of alamang (belacan). It is delicious and I agree with you that peeling the stalks is a tedious task. Thanks for this recipe. My mother is from Bicol but does not really cook so i had observed cooking laing (Bicol style) via relatives—they really dry the gabi plant upside-down for days and days. Then they cook the laing in a kalan. Gabi roots, stems and leaves immersed in secondary and tertiary gata squeeze until the liquid is really gone. For me it is really like making coconut oil—looong cooking. Then as the laing is about to cook, they pour over the kakang gata or first and purest coconut squeeze. Perfect, delicious and no itch. namit. one of my favorite pagkaon. ooh! 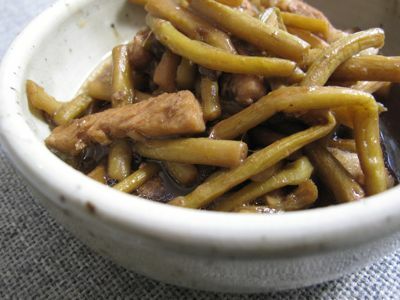 we call it daludal in Ilocano and it is most often cooked with dried fish and bagoong balayan. Serious rice fest! MM and Rhea, thanks for the clarification. Will surely try that dish soon. Takway, is that the Ilonggo term for “tampulong”? I know they are abundant this time of the year—there in the Philippines. Mother used to make tampulong salad without the itch. Oh, how they grow along with the wild mushrooms; wrapped and steamed in dahong saging; eaten with hot rice and pritong galunggong!!! Waaaah, homesick na naman ako!!! Takway caused me itching/skin rashing right after I was done scrapping the skin. I was heading to the bathroom when my hands and arms were itching big time! Even washing will not help. What I did was to put some efficascent oil and it worked. To all those who will be preparing takway, please be careful! correction: I mean skin rashes, not skin rashing. Sorry for the mistake. when i’m cooking this i usually boiled takway in different pan without stirring… When is it cook, i drain it..
Hope my tips helps u guys… Happy cooking… Mabuhay mga pinoy..